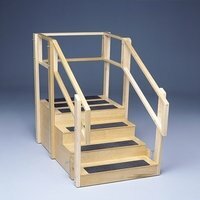 Special�Order Staircases and training stairs can be used to provide endurance, strength and balance training. Our models are available in three styles with non-slip tread for safety and padded handrails for comfort. Straight platform enclosed on three sides. Overall length is 55" (140cm) and the overall height is 54" (137cm). Comes complete with Bus Step. Riser height 6" x 10" tread (15 x 25cm).